Introducing: Paul Leonard, BASF Group. The British chamber was one of the first organisations I contacted when I was assigned 8 years ago to represent BASF here in Brussels. The chamber attracted me as a neutral and trusted platform with membership from a broad variety of organisations, and at that time I knew it would be important to benefit from such a network. It also offered a diverse range of events at which you could hear from and engage with policy makers at all levels. The chamber is very international. As it has a tradition of not taking public positions, it keeps away from tension and controversy which can be divisive in other organisations. Holding events under the Chatham House rule, the chamber has developed an enviable reputation for providing a trusted platform for discussion. This is important as it enables the chamber to attract speakers from a wide range of backgrounds and levels of influence. Since joining the chamber in 2008, I have watched it expand and become more professional. It’s great to see how the membership has developed. It is now more balanced, representing the unique business community we have here in Brussels, with a mix of organisations and companies, ranging from entrepreneurs to large consultancies to multinational corporations. It demonstrates that the chamber is inclusive, reflective of the businesses community and that it is relevant. The versatility of the chamber came into its own during the 2008 global food crisis, when it was possible to establish the Food Security, Safety and Sustainability task force (now part of the Food, Health & Consumers task force). It was one of the first platforms available in Brussels to talk to high-level, well-informed, influential speakers from EU and international organisations, on this important issue. Speakers included chief scientific advisers from the UK, US and EU and agricultural attaches from the world’s leading agricultural nations. This was of great importance, offering members the chance to be part of this important and on-going societal debate. It enabled the chamber to position itself and build a relationship with the UK government’s Department of Business Innovation and Skills. Membership of the chamber helped me access an expansive network, which would have been had to achieve on my own. 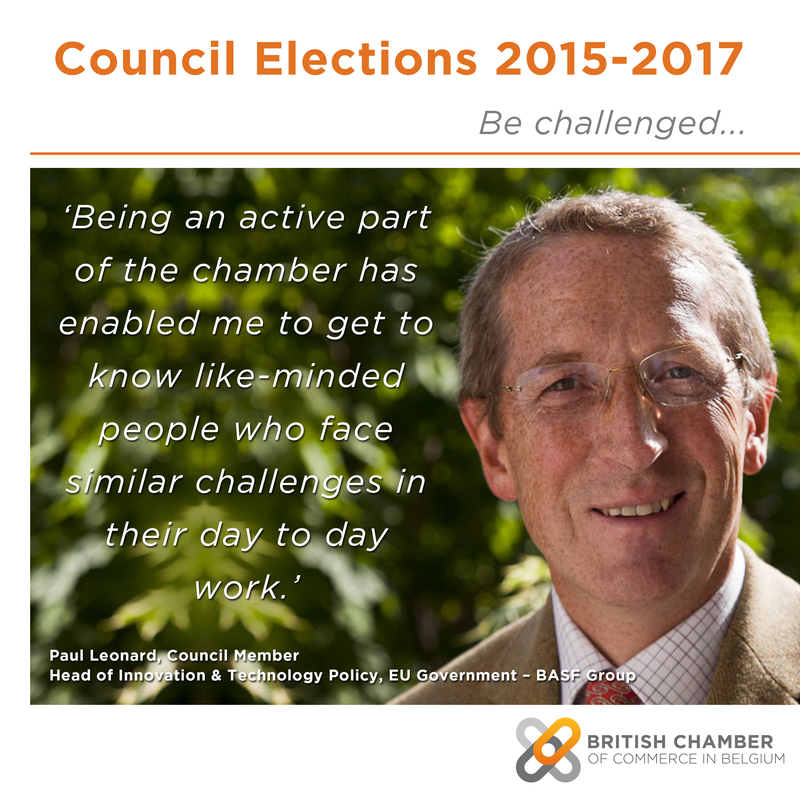 Being an active part of the chamber and a member of the Council is has also enabled me to get to know like-minded people who face similar challenges in their day to day work, including people from unrelated business sectors. Sometimes it is therapeutic to realise that we can face similar challenges and frustrations, and that we are not alone in this respect. I would encourage members to stand for election to the Council. You have to be committed and dedicated to the job, but it is worth the effort. The next term will be especially interesting as the debate about the UK being in or out of Europe is likely to become increasingly important, and this could have a profound impact on the business community. If re-elected, I would welcome the opportunity to contribute to Council for a third term, and to be able to help steer it through a historic period in relations between the UK and the EU.